Dream Beach offers a pleasant white sand, a fine place to relax and dip your toes under the warm sand. The scenery here is magnificent, magical, enchanting and very relaxed atmosphere. This waterfront has a beautiful cliff top view located at the right side. From this cliff, visitor can see an amazing sunset with a low-lying limestone cliffs and cave formation. A wonderful secluded beach with spellbinding scenery and serenaded by the sound of the ocean waves. 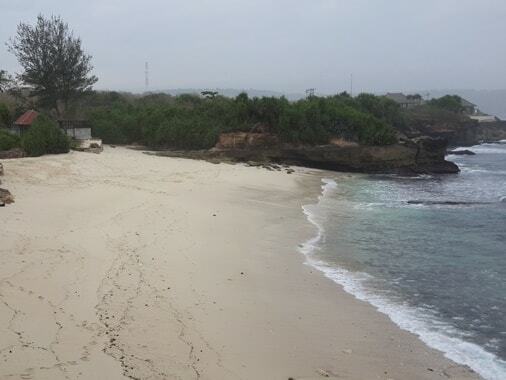 Let's take a closer look to the Dream Beach in Lembongan! Dream Beach is a wonderful secluded beach. This coast is a world away from the hassle and hectic pace. This beautiful beach also close to Sandy Bay, Mushroom Beach, and Devil's Tear. The coast has pleasant white sand, a fine place to relax and dip your toes under the warm sand. The scenery here is magnificent, magical, enchanting and very relaxed atmosphere. Visitors have to reach Lembongan Island first before set foot on this coast. The coast is located southwest coast of Lembongan Village, in the District of Nusa Penida, Klungkung Regency, East Bali. Visitor can get the location directly from Jungut Batu Port just about 3.5 Kilometers (about 10 minutes). This coastal is influenced by "Somewhat Dry Climate" or E type climate (based on Schmidt-Ferguson climate classification maps). Somewhat Dry Climate here has humid season which begin from December continues until April. The stone formation here is Alluvium Formation which consists of cobble, pebble, sand, silt and clay, as coastal deposits. The area is mostly covered by savanna forest vegetation. Dream Beach is blessed with romantic sunset and beautiful cliff top view. This spot is located at the right side of the beach. From here visitor can enjoying the sunset with the low-lying limestone cliffs and the dramatic cave formation. An enchanting beach with spellbinding scenery and serenaded by the sound of the ocean waves. This wonderful beach remains as one of the island’s best-kept secrets. Visitor need to be caution while consider to entering the water here. While the sea is rough the wave can be fierce. This secluded waterfront offers a reasonable excursion but the beach is not a swimming beach for children and novices. In the afternoons, visitor can see the seaweed farmer boats crowded around their plantation. Seaweed plantation is the main local occupation here. There is a cottage directly facing the white sandy beach. 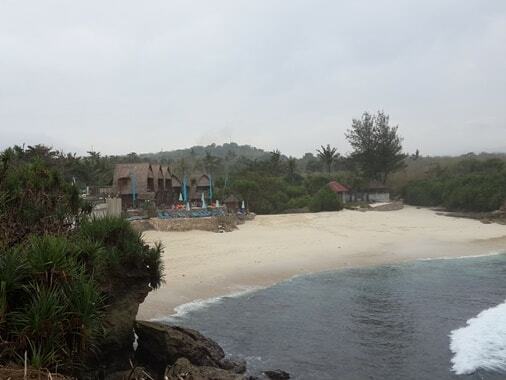 Dream Beach Huts Nusa Lembongan providing accommodation for visitors who come to this coast. Visitors can enjoy the beauty of the secluded beach atmosphere, relax in the restaurant and bar. There is also a swimming pool with spacious sun deck. 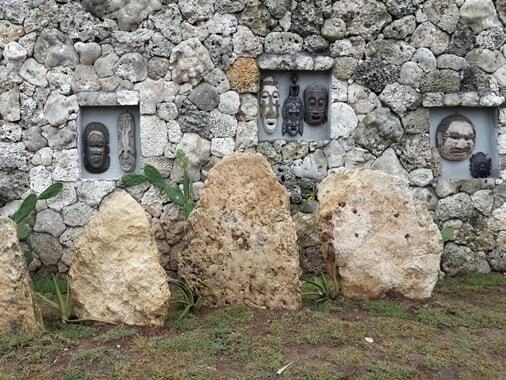 The sandy garden is no less interesting with pandanus, cactus and several primitive mask or statue fused in this beautiful scenery. 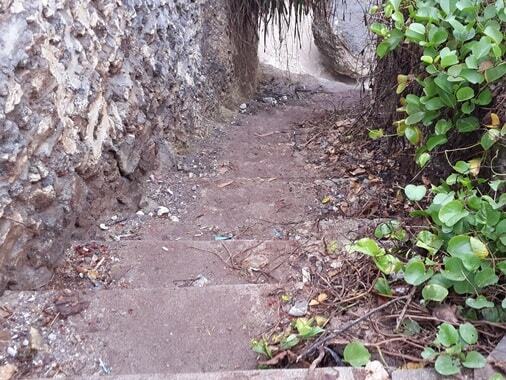 Devils Tear Nusa Lembongan has gorgeous rocky coast lines within walking distance of the Dream Beach. The waves break onto a narrow niche on a limestone cliff. It producing a dramatic swash with a merciless thundering sound. The devil is tearing it up with massively waves and pulverizes the rocky cliffs. It is a frightening power of Mother Nature, violently beautiful! 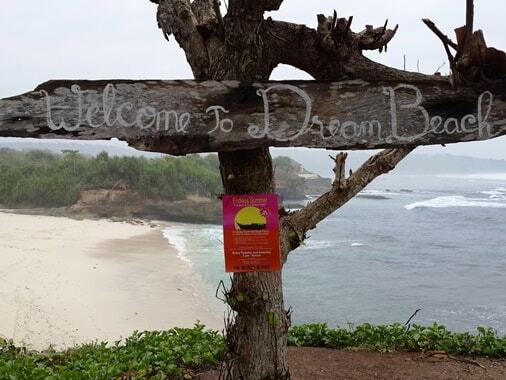 Take your time to visit Dream Beach Nusa Lembongan Bali, hopefully helpful and thank you! 1. Sandy Bay Beach Lembongan.